I bought a lot of Oregon Pinot when I rediscovered wine about 6 years ago. My red wine palate has changed since then, moved away from overt fruit and concentration and towards transparency and intensity. I still love Pinot, but moreso the wines of Burgundy, Cheverny in the Loire Valley, or the Jura. Are there Oregon Pinots that I enjoy today? Yes, but the key for me is to drink them without comparing them to Burgundy, to accept them as fruit-driven wines and to enjoy them as such. Am I going to buy these wines today? No, but that's because my tastes have changed, not because they are bad wines. Within a new-world framework, I think Oregon is making some excellent wines. 2002 Panther Creek Pinot Noir White Rose Vineyard, $35. Courtesy of Deetrane, my favorite of the bunch, and by a wide margin. White Rose is high up in the hills and is cool at night, so the grapes should theoretically have good acidity. I've had wines from White Rose before and they've been overly extracted, but not this one. This wine was dried rose petal red, translucent to the core, with lovely ripe red fruit and floral aromas. Well balanced and with an intense core of red fruit, this was delicious wine. 2004 Brick House Pinot Noir Cuvée du Tonnelier, $45. Started off strangely - salty umami notes, something like balsa wood, kind of medicinal, perhaps not entirely clean. But I came back to it two hours later and it was much better, with bright red fruit, good acidity, length, and intensity. Clearly this wine needs time in the bottle, as it wasn't pretty at first. Made with organic grapes, for you hippies out there. 2004 Belle Pente Pinot Noir Murto Vineyard, $35. If I had to pick one Oregon Pinot to buy every year, it would be this one. The vines are old, the vineyard is farmed cleanly (organic and using some biodynamic principals, I believe), and the wine maker seems to be going for balance and elegance, over extraction. And at $35, I don't feel like I'm getting ripped off. This was not the best bottle I've had of this wine, but it was quite good, with floral and citrus infused red fruit aromas, and a light and graceful texture. 2002 St. Innocent Pinot Noir Seven Springs Vineyard, $35. I'm not sure where this wine is in its evolution, but it probably will be better in a few years than it was on this evening. The nose is about dark fruit and it isn't revealing all that much, even after a few hours open. The fruit feels mature on the palate, stewed cherries, the tannins have begun to melt into the wine. Pleasant wine, but int he end, not all that interesting. 2005 Adelsheim Pinot Noir Ribbon Springs Vineyard, $44. BrooklynLady and I visited Adelsheim back in the winter of '05, when the grapes for this wine were just a twinkle in the vine's eyes. We have a soft spot for Adelsheim, but as the years go by I find myself less interested in the wines. They are well made, but they are so much about fruit, kind of one-note-wonders. This wine did have lovely ripe red fruit, very clean, and there was a nice herbal note. But that's really all I can say. About a quarter of the bottle was left out overnight, uncorked, and when I tasted it the next afternoon there was more focus and intensity, but still not a lot of complexity. Very good wine, but not the style of Pinot that I'm interested in these days. 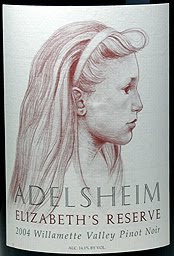 2005 Adelsheim Pinot Noir Elizabeth's Reserve, $44. This is a blend of grapes from Adelsheim's various vineyards, and it has Oregon's prettiest wine label, I think. This wine has great fruit, others in the group liked it very much in that way, but the oak is very prominent too. There just isn't a lot else going on, so it's hard to get excited. 2005 St Innocent Pinot Noir Justice Vineyard, $35. I liked this better a few years ago when it was first released. Now it's a bit muddy, with coffee and other wood elements obscuring the fruit. I drank this with Deetrane alongside another St Innocent 2005, and it is amazing how the two wines from two different vineyards showed almost exacltly the same. We fooled around, tasting each other blind on the wines, and I could identify Justice based on its slightly lighter texture, but the aromas and flavors of both wines were pretty much dominated by wood. 2005 St Innocent Pinot Noir Shea Vineyard, $39. This raw material in this wine doesn't seem to be able to absorb the wood treatment. Although I liked the 04, Shea just isn't my favorite St Innocent wine. If I drink St Innocent now, I prefer Anden or Seven Springs, both of which are no longer made. 2005 Thomas Pinot Noir, $45. This is a cultish producer who makes tiny amounts of wine, that's basically impossible to find outside of the Wilamette Valley in Oregon. We loved the 2002 and I brought a few of these home with me from Portland a year ago. I will tell you now that everyone on CellarTracker loves this wine, and that John Thomas has a great reputation as a wine maker, so take the following with a grain of salt. This wine was just no good. The alcohol on the nose was overwhelming, the fruit was candied, and the wine was utterly simple. Even those in the group whose palates are far more forgiving than my own regarding new world wines, even they didn't enjoy this wine. JD Headrick has done an interesting thing to help us get to know the people who make the wines he imports, and the places they come from. He created a channel on YouTube and uploaded home made videos. We can watch as he interviews wine makers, wanders through their vines and cellars, eats with them, listens to their stories. Never more than a few minutes long, these videos are really a lot of fun. 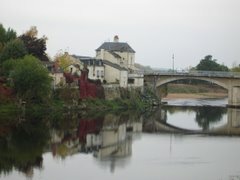 One learns, of course, about his wine makers and their wines, but also about the Loire Valley and wine making in general. Perhaps my favorite thing about watching, though, is the little glimpses they offer of this section of French life. Eating Oysters with Thierry Michon - this guy LOVES shellfish. Lunch at Domaine du Viking - think of this as an X-rated movie starring fabulous cuts of pork and beef. La Noblaie - a Walk Through the Vines - see Veraison in action. 1947 St Nicholas de Bourgueil Blanc with Frederic Mabileau - he opens a wine his grandfather made over 50 years ago. There are Rocks in my Muscadet - check out the vines growing on a massive wall of granite. Take a peek and see what you think. Sure beats reading a shelf-talker. I heard a story that I liked recently about Frédéric Mugnier, who makes some of the finest red wine in the world: he was asked what he drinks when he drinks white wine. Without hesitation he said "Muscadet." It tickles me that this guy whose wines sell for hundreds of dollars a bottle, drinks $15 Muscadet. There are many people who say that Muscadet is the world's finest value in white wine. I am definitely one of those people. And Marc Ollivier at Domaine de la Pépière makes what I think is the finest value within Muscadet, his Clos des Briords. The vines in Briords are over 70 years old and the soil is particularly good - the resulting wine has everything you would expect in top quality Muscadet, but is richer and more powerful. Typically the wine takes a year or so to reveal itself, and is renown for its longevity. People drink these wines at 30 years old, something I have never done, but I hear they are fantastic. More information about Marc Ollivier and the Clos des Briords is available on the Dressner Selections site. 2008 Domaine de la Pépière Muscadet de Sèvre-et-Maine Sur Lie Clos des Briords, $16, Louis/Dressner Selections. It can be hard to tell what's going on with young Clos des Briords. The acidity can be searing, the fruit and the rocky mineral all tangled up, the aromas and flavors rather fierce. I remember loving the 2005 almost immediately upon release because it was so open and expressive. Perhaps the ripeness of a vintage like that one allows for more pleasure in young Briords. I thought the 2007 was delicious at first too but it was also very angular and sharp, needing time in the cellar find its inner harmony. I'm pretty sure that 2008 was a difficult vintage in Muscadet and yields were way down. Perhaps that's why the 2008 even now shows such beautiful concentration, such great depth. The 2008 is absurdly delicious right now, tightly wound, but with gorgeous citrus and black licorice aromas, creamy and smokey undertones, and loads of rocky mineral character. It is fresh and pure on the palate with soaring acids and the echo of seashells on the finish. This is a wine that seems to be stripped of everything unecessary, only the essential parts are here, and it is beautiful. My favorite Briords since 2004, although they certainly are all very good. We drank this without the standard seafood accompaniments - just quaffed it as an aperitif, and it was great. Later on in the evening I took a bite of pizza and found that I had essentially no enamel left on my teeth, but it was worth it. Although this is entirely drinkable now, especially if opened a couple hours in advance, it seems clear that this is a wine that will improve with cellar time, an I will test this theory out myself, I assure you. You know what I realized the other day? I have never purchased a bottle of wine, cellared it for long enough so that one would consider it "ready" to drink, and then drunk the wine. I simply haven't been collecting wine long enough. The mature wine I drink is purchased way after release, or comes to me via generous friends, over meals we share. I recently drank a glorious bottle of 1995 Chandon de Briailles Corton-Clos du Roi, a bottle I purchased in December of 2008 while in Beaune. Let's see, by the summer of 1995 I had been out of college for two years. I spent the first year waiting tables at a French restaurant in Manhattan, and the second year as a middle school science teacher at a South Bronx public school. I wasn't buying Grand Cru Burgundy on my pathetic teacher's salary. I never tasted this wine young, and then decided that I would age it about 14 years before drinking the next bottle. I bought it and hoped for the best, and this time, that's exactly what I got. In the first half of 2009, I drank a bunch of Muscadet and decided to age Marc Ollivier's 2007 Clos des Briords and Jo Landron's 2007 Fief du Breil, and the 2002 Luneau Papin Clos des Noelles Excelsior. I'm hoping to wait 10 years before trying the next bottles. I made the decision to cellar those bottles because I drank them, and other Muscadets, and given my constraints regarding space and money, I felt that these would be the most rewarding to cellar. With wines that cost $16-$22, I can afford to drink them young and figure out for myself what I want to do. The other day I purchased a bottle of 2006 Chandon de Briailles Corton-Maréchaudes on sale for $66. That's well into splurge territory for me, something that happens infrequently. And I have never tasted this wine, nor have I tasted any wine from Maréchaudes, not that I can remember. But I bought it with complete confidence based on the producer, and on the larger place - Corton. I assumed when buying it that I would cellar it for about 12 years. Is that weird, to invest 12 years in a wine that I've never before tasted? Maybe not. I've had several mature Corton wines, and they develop beautiful complexity with time. Why would this wine from this fantastic and old-school producer be any different? After all, I just drank the 1995 a few weeks ago and it was utterly gorgeous, with fresh ripe fruit that crackled with minerals, and a pungently animale undercurrent. I want my 2006 to become like that wine, the 1995. If I wait 12 years that will surely be the case, no? I wish I could afford to drink this young, to get a better sense of its potential. I tend to jump on the "cellar-your-wine" bandwagon, blindly assuming that my splurge wines must improve if I cellar them. And hopefully they will, but who knows what will happen when the cork is eventually pulled - not every wine that is supposed to age well actually does. Some people say that we fetish-ize the aging of wine, and that the point is lost somewhere - we do it just for the sake of doing it, without any real sense of what we're trying to achieve. At a recent industry tasting I had the chance to taste the 2006 Chandon de Briailles Corton-Bressandes. It was unmistakably and immutably delicious, even at this crowded and loud event where it is not possible to really understand a wine. It is all about fruit at this stage, but it is elegant and deeply pitched, with a dense and concentrated feeling yet not at all heavy. Surprisingly, the harsh young tannic structure that I expected was not present. I would quite happily drink this wine now, and some people would say I'd be committing a crime in doing so. Perhaps they're right - perhaps the full character of this great wine needs a decade plus in a cold cellar in order to express itself. But isn't a bird in hand worth two in the bush? In this particular case, I know what I'm trying to achieve by cellaring my 2006 Maréchaudes. But since I never drank the 1995 young (or any of the other Corton I've been lucky enough to drink), I don't have a sense of what the beginning should be like. In other words, I know what the end should be like, but I'm not sure about the beginning. And now that I am ready to create my own beginnings, I'm not on entirely steady ground. I went to the big Michael Skurnik / Terry Theise tasting last week, the only tasting in NYC where one can gaze upon Robert De Niro's father while sampling wine. I arrived quite late and had nowhere near enough time to taste everything. So I focused instead on the producers I like the most, trying to get to know the new versions of their wines. Many of the non-vintage Champagnes are based on 2005 grapes, a very ripe year, as it was in most of the wine making world. Peter Liem of ChampagneGuide.net said that at one time he thought 2005 juice will make for very good non-vintage wines, in general. Now he's not so sure, as some wines are showing overripe flavors. There were also plenty of NV wines based on 2006 grapes, another very warm vintage, but with a cool and wet August that perhaps allows the finished wines to show better balance and freshness than the 2005's. Where am I getting all of this Champagne vintage and climate information from? Please let me interrupt this post to tell you something very important: Peter has added new features to what is already the best online Champagne guide - there is now a 'vintages' section that provides detailed info on Champagne vintages, an 'articles' section where he will publish a feature length article every month, and most excitingly, for me anyway, a blog. Peter hasn't been writing about Champagne anymore on Besotted Ramblings, but he's blogging again on his new site and the posts are as fun, interesting, and chock full of insider's information as you would expect. The Gaston Chiquet NV Brut Tradition was based on 2005 (80%) and was very nice wine, although it did not seem to have the energy that I remember it having. Plenty of ripe dark fruit, but this wine is 45% Meunier and it felt a bit too spread out, its frame too malleable. The Chartogne-Taillet NV Brut Cuvée St Anne was based on 2005 (80%) and for the first time ever, I was not terribly impressed with the wine. I liked the nose a lot, with its flowers, ripe fruit, and chalky earth. But the palate felt a bit clunky, without the focus and clarity that I am used to. The Pierre Gimonnet Brut NV 1er Cru Blanc de Blancs was better than I remember though, with a delicately focused nose of flowers and chalk. It felt both lacy and ample on the palate, and although I don't have terribly high expectations for this particular wine, I really liked this version. It was based on 2006 grapes, as it turned out. The other NV Blanc de Blancs that I liked a lot was the Pehu-Simonet NV Blanc de Blancs, this version almost entirely 2006 (90%). The nose was just gorgeous, with salty white flowers, very gentle, and the grapes are all from Mesnil, as with a famous Champagne you may have heard of, called Salon. The Lallement NV Brut smelled great, with clean dark fruit and a brooding earthiness, and it tasted great too, very well balanced. It is 80% 2006 grapes. The interesting thing is, my favorites turned out to be more of a combination of 2006 and 2005 grapes. The René Geoffroy Brut NV Expression is always one of my favorite NV wines. This version is 65% 2006 and 35% 2005 grapes, and although it is more overtly fruity than in the recent past, I thought it was complex, well balanced, and just lovely. And the Henri Billiot NV Brut Reserve is 50% 2006, 25%2005, and 25% 2004, and it was delicious, open and inviting with ripe dark fruit and great energy. This wine always improves dramatically with a year or so of bottle age, and I'm curious to see what will happen with this particular version. Perhaps the folks in Champagne were onto something, with all of this blending. There were some thought-provoking comments on my post from earlier this week about, among other things, whether or not it is possible to predict a producer's overall level of quality based on the quality of their Bourgogne. A few people raised the issue of whether or not Bourgogne as a category of wine is worthwhile, based on quality to price ratio. I don't have a definitive stance on the subject - I can make a case for both points of view. Bourgogne from top producers such as Ghislaine Barthod or Sylvain Cathiard costs upwards of $35. Dugat-Py Bourgogne goes for over $50. If you're talking about Leroy or Coche-Dury, you're closer to $100. Are those wines "worth it?" Are there great Bourgognes? That question must be answered on an individual basis. I can tell you that I do not purchase those wines, and the reason is simply because there are wines for $35, $50, and $100 that I would much rather have. There are great Burgundy wines that cost $35, $50, and $100, but I don't believe that they are Bourgognes. Still, I wouldn't say that Bourgogne is a worthless category. What if you want to spend $25 or less, and drink red wine from Burgundy? You're drinking regional wine - Bourgogne or Hautes-Côtes de Beaune/Nuits. There are producers making very good Burgundy wine at this price point, but most do not, and I would rather buy great wines from other places for $25 than merely pleasant Bourgogne. I'd rather buy Coudert Fleurie Cuvée Tardive, anything by François Chidaine, Luneau Papin's Excelsior Clos des Noelles, Terrebrune's Bandol Rosé, Puffeney's Poulsard, Bernard Baudry's Les Grezéaux, and many, many, many other wines that, in my opinion, are amongst the finest wines of their type. Even though there are some great regional Burgundy wines, none of them are among the finest red wines of Burgundy. So what are the best regional Burgundy wines at about $25? Everyone has their own opinions on this. My list includes Simon Bize's Perrieres, Sylvie Esmonin's Cuvée Sylvie, Maréchal's Cuvée Gravel, Rene Leclerc's Bourgogne, Lignier-Michelot's Bourgogne, and Michel Lafarge's Bourgogne (although that one is probably more expensive now). For a while my list was growing. Now it's actually shrinking, as I become more knowledgeable about what I like. Although I am more picky now, I still like to try regional wines from great producers when I can, and this week, thanks to a sale, I was able to buy a bottle of 2006 Pierre Morey Bourgogne Pinot Noir for $22, Imported by Wilson Daniels. 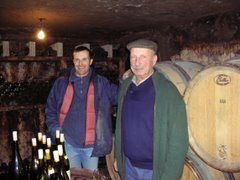 Pierre Morey, for many years the wine maker at the venerable Domaine Leflaive, is famous for making thrillingly precise and terroir expressive white wines. I wish that I could have done this little experiment with his Bourgogne Blanc, but we've been talking about red wine so far. And as I learned when I visited him in Meursault in December, Morey's reds are also quite good. What about this, his most basic of red wines in 2006? Would it be a worthy regional wine, or a missed opportunity to buy a bottle of great Cru Beaujolais? Pierre Morey is a great master, and I say this will all due respect - this particular wine is not a good argument for spending money on Bourgogne. The nose has some nice floral aromas, some dried leaves, and some dark pinot fruit, but this wine is not easy on the palate. The tannins are drying and there is a prominent stems and underbrush sensation. The overall feeling is rustic, a rug of dried leaves. Four hours in the wine is a bit more tame, but it is what it is - decent Bourgogne from a great producer in a pretty good year. I'd rather have a bottle of Baudry Les Grezéaux. Wine Retail is like Egg Sushi, and so is Champagne. But Burgundy isn't. I once heard a story about sushi that really impressed me. The true sushi expert, when trying a restaurant for the first time, always begins by ordering Tamago, or egg sushi. Egg sushi may not be as exciting as sea urchin (Uni) or fatty tuna belly (Toro), but it is through tasting this basic dish, this omelet made by rolling many thin layers of seasoned egg batter, that the sushi expert can predict whether or not the sushi chef's seafood dishes will be worthwhile. I was reminded of this story the other day while doing my work shift in the basement of the food coop, cutting and packaging cheese. There was a discussion about restaurants and a Swiss woman asked which local places had the best house wine. She meant exactly that - house wine, unlabeled wine in a carafe. I had been minding my own business, using a wire to cut a block of Comte, but my ears perked up at this. "Why are you interested in house wine," I asked. "Where I come from," she said, "you can tell if a restaurant carries good wine by tasting their house wine. They select it carefully, and it's supposed to tell you about their ability to find good wine, as well as about their personal taste in wine." Hmm. I like that idea, but I don't think things work that way here. There may be places offering good house wines, but I don't think that the American wine lover goes to a restaurant and uses house wine as a litmus test, the way the Sushi expert might with Tamago. This got me thinking about wine stores. A good shop has several good wines available at the $12 price point. There isn't a lot of good wine available for $12 in the NYC market, but all of my favorite retailers offer something interesting and delicious for small money. They didn't become my favorite retailers based on this, but they do have this in common. I wonder, the next time I'm traveling or in a store that's new to me, if I begin by examining the $12 and under wines, will I be able to predict whether or not the store as a whole is any good? The Tamago story also got me thinking about Champagne and Burgundy. Does a great Bourgogne mean that the producer's higher level wines are great? Does a great non-vintage Champagne mean the producer's vintage wines and the special cuvées are also great? 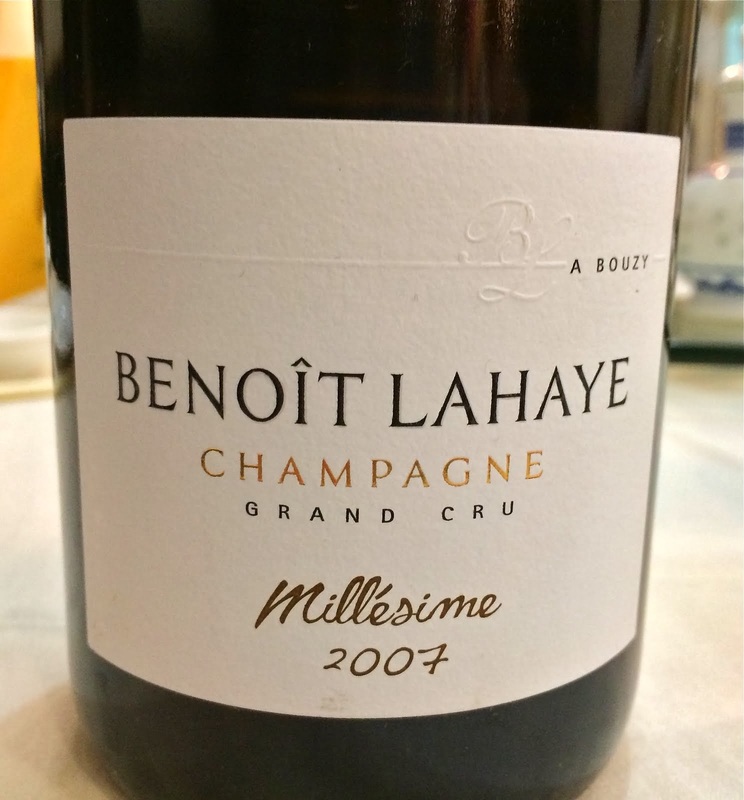 In Champagne many producers are careful to craft excellent entry-level wines because they understand that most consumers will never taste their better wines - their reputations can be built entirely on their basic cuvée. Regarding Champagne, I think that it is reasonable to make predictions about a producer based on the quality of their most basic wine. I want Billiot's, Boulard's, and Bouchard's basic wines as much as I want their top wines. Although it is true that most people will never taste the top Burgundy wines, I don't think it is practical to make predictions this way in Burgundy. Reputations there are built on the caliber of the top wines from the top vineyards, and Bourgogne can be an afterthought. Many of the best producers, like DRC, Roumier, Mugnier, or Dujac don't even make Bourgogne. I'm not sure that it would be good strategy to make predictions about a producer based on Bourgogne, or whatever the basic wine is. Yes, there are great producers who make great Bourgogne - Lafarge and Mugneret-Gibourg, to name two. But as I think about it, most of the Bourgogne I drink (Lignier-Michelot, Voillot, Sylvie Esmonin, Leclerc) most often does not come from the producers whose top wines I want to splurge on, and with the exception of Mugneret-Gibourg, I don't buy Bourgogne from the producers whose top wines I buy. Is this because I'm buying the wrong Bourgogne, or because in Burgundy the predictive relationships are far more complicated? I wish there were Burgundian version of Tamago. I used to write about sparkling wine every Friday in a sets of posts that I called Friday Night Bubbles. Every week for over a year, typically alternating between Champagne and other sparkling wines. It got expensive, but what made me stop this series was the fact that I wasn't satisfied with the quality of most sparkling wines at the $20-$25 price point. I decided that I'd rather spend my $25 on whatever wine I think is best, not necessarily a sparkling wine. And so my sparkling wine consumption has gone way down, Champagne obviously included. In the past two weeks, though, I've had more top notch Champagne than in all of the past year, I would say. These things come in waves, I guess. I know it's boring to read lists of "The Great Wines I Just Drank," but please - allow me to share about some of these. These are rare and expensive wines that I may never have another chance to drink, and they are worth talking about. I was in Seattle last week for work (thanks for having me back here, by the way). I know no one in Seattle, and I had business all day but nothing at night. I did take myself out to dinner one night at this place, and it was quite nice. But a million times more fun was dinner at my new friend Brian's house, a guy I met through another friend I met because of this blog. And they say that sitting in front of your computer is anti-social! Brian works for Triage Wines, one of the better importer/distributors on the west coast. He invited a few other Seattle wine-types, made a beautiful dinner of schnitzel and other goodies, and we opened what might in some circles be called an excessive amount of wine. I could tell you about the three 1998 Rieslings we had with dinner, including the FX Pichler Unendlich, but this is supposed to be about Champagne. So instead I'll tell you about Sugot-Feneuil, a producer I had never heard of. Brian served the 1998 Brut Blanc de Blancs as an aperitif, and it was just lovely, so full flavored, and also so elegant. But this was a fleeting experience, as apparently the grower is deceased and the vines have been sold to a big house. That was only the beginning. One of Brian's friends brought a bottle of 1997 Larmandier-Bernier Special Club, I think the last Special Club vintage that Larmandier-Bernier did. This wine took a while to open up, but when it did it was a well balanced wine with rich nutty fruit and a mouth-coating texture. I think that it was starting to truly shine after we had moved on to other wines. And how about this - Brian went downstairs to his cellar (normal people can afford to live in houses in Seattle, apparently) and returned with not one, but two bottles by Vouette et Sorbée. We drank the Saignée de Sorbée (photo courtesy of Peter Liem) and the Blanc d'Argile, both 2006's, although they are not labeled as vintage wines. Both of these wines were entirely remarkable, impossible to overstate the level of quality here. The fruit in the rosé was utterly beautiful, almost impossibly fresh and alive, sweet and perfumed with subtle spices. Like all Vouette et Sorbée wines, this has no dosage - imagine how perfectly ripe these grapes must be! The other thing that I found striking about the rosé was its texture - full and rich, but exquisitely detailed and fine. Such a joy to drink. Peter and I drank the 2005 Saignée de Sorbée merely days before this Seattle dinner, and it was also a great, but an entirely different wine. The 2005 was not as much about fruit, it was completely saline and pungently rocky and earthy, and it was great with our roast bonito. The 2006 was a far more hedonistic wine that offered immediate and intense pleasure, but I wonder which wine will be better in 10 years...The Blanc d'Argile was also great, with that same brilliant fruit and texture, but I was so smitten with the rosé that I could barely pay attention to anything else. Thank you again Brian, and your welcoming and generous friends too. The funny part is, you probably think that's all the great Champagne I've had recently. Not at all true, friends. I went to Alice Feiring's house the other night for her Champagne tasting, a semi-blind (we saw the list of wines, but drank them blind) look at a handful of wines with the idea of discussing whether or not they represent good value. I'll leave the results of the value discussion for Alice to print in her upcoming Wall Street Journal article, but I'll tell you that the wines in general showed tremendously well. I learned that Drappier makes very good wines - the nose on the 2002 Grande Sendrée was fantastic, rich and nutty with a focused depth of clean fruit, intriguingly orange-y in character. And I confirmed for myself that I am a huge fan of both Billiot's and Lallement's basic NV cuvées. That Larmandier-Bernier's Terre de Vertus smells and tastes of seashells, and that the 2004 Raymond Boulard Les Rachais Extra Brut will be excellent in about 8 years. Boulard's wines, in my humble opinion, might be the best value in the NYC Champagne market. The three "S"s - a part of any balanced diet. 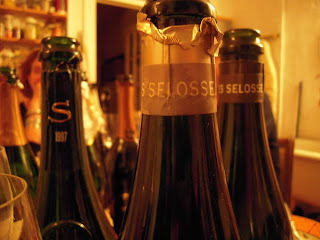 Alice somehow stocked her Blanc de Blancs lineup with 1997 Salon, and two different Selosse wines, Substance and VO. Yes, I drank Substance twice in two weeks - very extravagant. When I drank the VO I thought it was Substance, as the nose was immediately reminiscent of the wine I drank with Peter the week before. Wine maker's stamp, I guess. The '97 Salon took a while to unwind, but when it did it was just gorgeous, so expansive and richly satisfying in the mouth, and so perfectly balanced. Alright, that's enough, I'm running out of gas - just excited to be back, I guess.